I had a little party with some friends recently (you’ll hear more about that soon), and I made these roasted grape and ricotta crostini. I wasn’t actually going to share this recipe until I tasted it and had that “holy crap I need to share this recipe” moment. Bear this in mind when you see my photo. See? Oh well. Make the recipe and you won’t care that I pulled a “Hold on I have to hurry up and photograph this recipe.” I wasn’t taking it outside for natural light, I wasn’t getting linens to match, I was just grabbing a shot of it and getting back to hanging with my friends. Roasted grapes might be one of my favorite things. 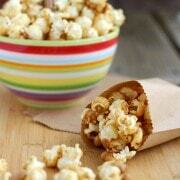 I mean…they aren’t replacing popcorn anytime soon but I do love them! Back in the day, I first tried them in this pork tenderloin with roasted grapes and ever since, I’ve been hooked. They are sweet, soft, and so flavorful. If you haven’t tried them, make these crostini and enjoy! 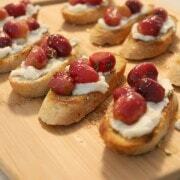 Your guests will love this crostini appetizer. Simple to make and so delicious and unique. Perfect warm or at room temperature. Meanwhile, heat a skillet over medium-high heat with 2 tablespoons olive oil. 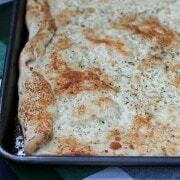 Place bread with one cut side down into olive oil and toast until golden brown and crispy. 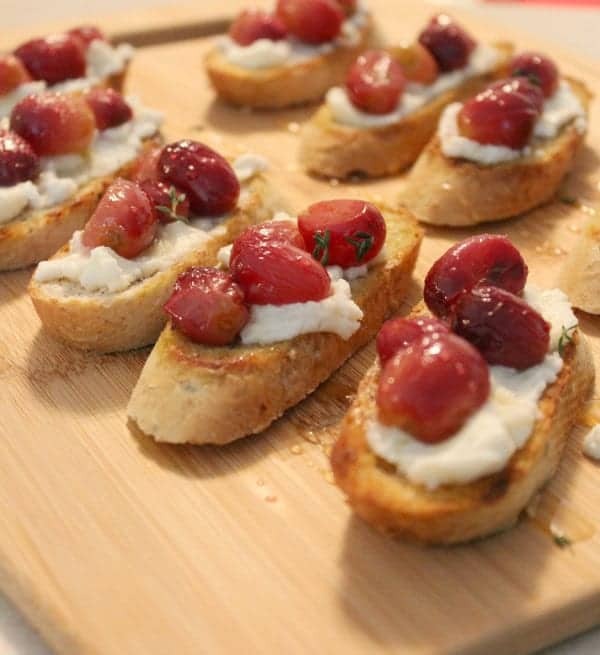 Spread ricotta over toasted bread and top with roasted grapes, extra thyme, and drizzle with honey. Enjoy immediately(ish). Verdict: I loved these little toasts and so did all my friends. Husband’s take: Sorry you missed out, Ben. Changes I would make: Make MORE next time. PS: I just found out that if I take photos on my phone in rapid succession, they are automatically uploaded to Google+ and then converted into a GIF. Want a glimpse of my life and E’s super funny cross-eyed look? Here we go…potty on the floor and everything. Woohoo! If only you could hear N giggling. I think that the ricotta would make the bread soggy, but you could toast the bread and roast the grapes in advance. Then it wouldn’t take too long to put together. Your kids are too cute!! I need to experiment more with roasted grapes! And your cute as hell kids? Just stop it. oh my gosh I love that GIF! I might have to make a few of those! E makes the craziest faces!! Love these crostinis too! What a great combo!! Love that adorable GIF! Your kids are just so cute. And these little bites sound perfect as well – love the idea of the roasted grapes in there! Wow this looks fabulous! Love the fruit and cheese combo! Thanks! I hope so too, Sarah! Please come visit me in CA. Our kids can be insane together. Also, I’m roasting grapes tonight, because you inspired me to. This looks great! Umm yes–we need to get these kiddos together! What did you do with your roasted grapes? Yum! I might have to adapt these to a phyllo cup version for a dinner party! 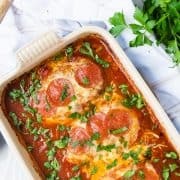 OMG, one I love this recipe but I think your cute kids rule on this post. Love the potty in the back. No shame. I love the combo of fruit and cheese! YUM! Your kids are the cutest! I LOVE this crostini, it looks so fabulous! Thanks Miss! See a familiar quilt in the background? I didn’t notice at first! I was too caught up in those stinkin cute crossed eyes. What a funny video!! I love that you can do that. I take a lot of random pics of the kids, but am awful about taking videos. And I can’t believe she can cross her eyes – I can’t even do that! I also love roasted grapes. We put them on our pizza! I know! She is sooo goofy. I know! I wish it was video, N was cracking up.